Orkhan Huseynov’s Atelier Sovetsky is an eight-channel video installation dedicated to the theme of the Baku street known as ‘Sovetskaya’ (meaning Soviet Street). In Soviet times, almost every town in the USSR had a street with this name. Sovetskaya Street in Baku, the capital of Azerbaijan, was not just an ordinary street like any other - it possessed a unique subculture. In other words, this district was a separate, and in many ways self-sufficient world, with its own rituals, ideas and laws shaping the everyday lives of its residents. Why did the artist conceive this project? Because this street, according to the dynamics of the construction boom and the architectural master plan for the city, is now undergoing a radical transformation – or, to put it plainly, demolition. Huseynov’s video aims to document the subtle mental landscape andunique atmosphere of this street. If something of significance is to be demolished to suit the expediencies of urban planning, then it is worthwhile to reflect on that part of the city and ensure that its enduring spirit, so dear to many generations, is preserved in people’s cultural memory. Contemporary art provides the necessary conceptual tool for such reflection. The artist’s work, then, is linked with the theme of memory – in other words, the theme of conscious life itself, which is not possible without memory. The enduring significance of memory needs no proof. One’s sense of self is rooted in an uninterrupted process of self-remembering, i.e. memory of one’s own existential core. Something happens every day: there is a change in one’s surroundings or situation, the backdrop to one’s life. But the person living through all these changes and observing them as an onlooker always remembers who he is. He remembers, thanks to his memory which contains the ‘common thread’ of his inner identity. He may be swept away by some activity or may plunge, ‘self-forgetting,’ into a situation that fills him with turbulent emotions, but never for one second does he doubt his own identity; he does not lose his basic sense that yesterday, today and tomorrow he is himself and no one else. Loss of memory as the basis of self-identity, in cases of serious brain injury or Alzheimer’s disease, is equivalent to destruction of the individual as an integral, self-aware being. In such cases a person may continue to live for a long time as a physical body, but as a mentally and socially active individual, he dies. Chingiz Aitmatov’s novel The Day Lasts More than a Hundred Years is the story of a man who is taken prisoner and undergoes terrible tortures, the aim of which is to deprive him of memory. He is turned into a being which, though human in form, has no memory of its previous life. In this novel, the author introduces the idea of the mankurt, a man without a past, virtually a zombie, who can be used to carry out murders and other sordid tasks… Over time, this word has become a generic term. We have established, then, that a person’s loss of memory and the past - as one of the links in the time vector of past-present-future - implies destruction of the individual, a spiritual death. Does this also apply to the community? Probably it does, as illustrated in expressions such as ‘collective memory’ and‘collective unconscious.’ Memory is a characteristic of a social organism, a nation, a people or any community of individuals, and the loss of this memory results in destructive processes and the disintegration of the collective body. With the disappearance of Sovetskaya Street, a whole stratum of Baku’s history is lost. An entire subculture is disappearing. What was this iconic street? On the face of it, unsightly, old one- and two-story houses, built around yards. No special amenities or comfort. You could call them slums. But it was just these difficult living conditions that created the special microclimate of this district. Here, in Soviet times, the influence of Soviet legislation was least felt. The atmosphere was one of criminality and a kind of reckless, anarchic freedom of spirit. Instead of the codified laws of the Soviet Union, precedence was given to a concept of honor and an archaic understanding of justice, springing from the moral code and philosophy of life of the inhabitants of the Greater Caucasus. Settling of scores by force (combat), often with weapons or firearms, was preferred here to regulatory criminal law. This was, in its way, a tough, simple ‘corporateethic’. The criminal ‘authorities’ enjoyed real authority and respect among the residents of this district, especially among young people, who, for their part, were quite happy to indulge in drugs. But at the same time there was a special warmth arising from lively human presence and participation; people were close in spirit, both in their joys and in their misfortunes, and this humanity, together with elements of ‘direct democracy’, created the vibrant subculture of the Sovetskaya Street district. Through his work, the artist Orkhan Huseynov has tried to preserve a ‘mental extract’ of this subculture in the historical memory of the people of Baku. The eight screens of his video installation show little scenes with minimal physical activity, taking the form of small expressive gestures associated with the behavioral conventions which prevailed in the Sovetskaya Street district. 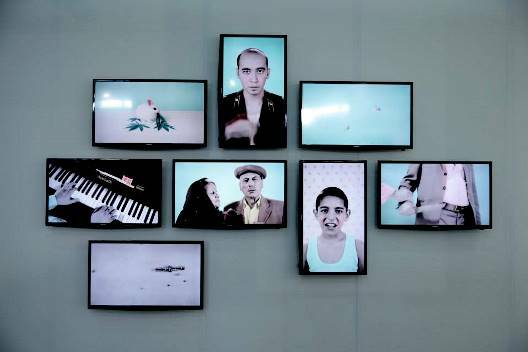 Despite the use of modern moving-image technology, the artist has chosen a retro style – the mini-actions on the screens are presented in the style of old Soviet black-and-white photographs, which photographers themselves, in the 1950s, 1960s and even later, liked to tint with gentle coloring, i.e. they retouched black-and-white photos with special dyes, turning them into sugary-sweet, glamorous pictures. But they were not seen as glamorous in their day – the technique was routine. Almost every Baku family kept such photos in their family albums. In the Atelier Sovetsky, the ‘retrospective’ content is in keeping with the ‘retrospective’ form. The artist’s work, reflecting scenes of characteristic ‘mini-gestures’, aims not only to recreate the chains of associations linked with this district of the city, but gives visual form to a new, modified folklore.